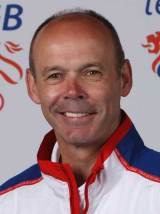 Sir Clive Woodward is a former England international who also coached the national side between 1997 and 2004, memorably steering them to Rugby World Cup glory in 2003. His playing career began with Harlequins in 1974 before switching to Leicester in 1979 following a spell at Loughborough University. He made his England debut as a replacement against Ireland on January 19, 1980 and went on to claim 21 caps as a centre with his last appearance coming against Wales on March 17, 1984. He was also selected to tour with the British Lions to South Africa in 1980 and New Zealand in 1983, winning a total of two caps. In 1985 work took him to Australia where he played for the Manly club in Sydney. He returned to the UK in 1990 and began his coaching career with Henley and after spells with London Irish and then Bath he took the reins of the England team in 1997, taking over from Jack Rowell. A disastrous tour of Australia, New Zealand and South Africa, famously coined the 'tour of hell', followed the year later that included a record 76-0 defeat to the Wallabies. Woodward famously asked to be judged on the side's performance at the 1999 Rugby World Cup and when his side were beaten by South Africa in the quarter-finals his position was questioned. The Rugby Football Union kept faith with him and Six Nations title followed in 2000 and 2001 and a much-prized Grand Slam in 2003. That was followed by success at Rugby World Cup 2003 in Australia with Jonny Wilkinson slotting a last-gasp drop goal to clinch a 20-17 victory over the defending champions and tournament hosts. He was knighted in the 2004 New Year's honours. Woodward opted to remain in the England hot-seat after his side's triumph but his side failed to reach the same lofty goals in 2004 but chose to quit later in the year, having already accepted an invite to take charge of the British & Irish Lions on their tour of New Zealand in 2005. All aspects of his management of the tour was questioned and the tourists lost the Test series 3-0. After leaving rugby Woodward worked as Performance Director and then Director of Football at Southampton Football Club before parting company with them in 2006. Later that year, after reportedly being passed over for the Rugby Football Union's Director of Elite Rugby role, he was appointed the new director of elite performance for the British Olympic Association. Woodward released his autobiography, 'Winning!' in 2004.